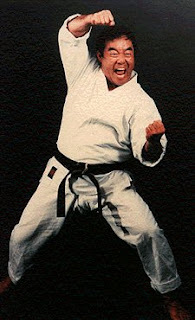 Joe Lewis, sport karate's first badass from the 60s, is said to have had the ability to detect kyo (weakness) in his opponents. Whether in mind, body or spirit, Lewis would own you. Likewise, heavyweight boxing champ Sonny Liston had developed a habit of scaring his opponents half to death before the fight even happened. He perfected a glowering presence when entering the ring, and would go so far as to stuff towels under his robe to enhance his already massive frame. Both Lewis and Liston always gave the impression that the match was personal and that they wanted to kill you. In the animal kingdom, defense mechanisms rooted in illusion bear a similarity to the psych-out fight strategies found in athletes. For example, the common house cat (a natural predator) will arch its back and raise its hair to give the physical appearance of being far more formidable than it actually is. When Miyamoto Musashi advises to "make yourself larger than your opponent" this is not strictly a metaphor. It's interesting that in Musashi's tome, The Book of Five Rings, very little is discussed in terms of actual technique. His forte was cunning and effective cheating or whatever else would get the job done. Musashi's real weapons were psychology, intimidation, and especially, intent, which could only be forged through severe training. By his estimation, of the sixty or so men he defeated in duels, many had superior technical skill, strength, or the advantage of youth, but lacked the moxie to gain the upper hand. Overcoming fear is an obstacle that any warrior must face sooner or later, but using your adversary's own fear can prove to be a viable way to level the playing field. Sokaku Takeda, the Daito Ryu Aikijujutsu master who taught Ueshiba, who in turn founded aikido, talked about the look of death. I watched my aikido sensei during a demonstration. He was doing randori with 7 or 8 guys. At one point, one of his uke had a clear path to him and charged at him from his back with a bokken, ready to get him. At the last second Kushida Sensei turned and put the look on him. The uke's upper body sort of froze, while his feet ran out from underneath him. I asked him afterwards what had happened. He said "I thought Sensei was going to kill me." Apparently it's an effective technique. Interesting thing about the Star Wars series: They have more references to martial philosophy than most MA flicks. "The secret...is to overpower the opponent mentally at a glance and to win without fighting." Nice post. Although people say "try not to fear your opponent, they are just flesh and bone" it can be hard to do so. However, this theory is completly true. It takes practise and lots of training with many different types of fighters and people. After a while though fear of others usually minimises. Very interesting article indeed: it is simply amazing how much psychology is behind martial arts. In fact the winner attitude was also described by Bruce Lee, perhaps in the Tao of Jeet Kune Do itself.